When you have a fireplace in your home and you also have children in the home, you need to place an added emphasis on fire safety. While fireplaces are not dangerous when used properly and well-maintained, they can be hazardous in the hands of small children. Make sure your kids have a deep understanding of the importance of fire safety from the time they are very young. Check out these fire safety tips for kids and schedule chimney repairs with our team right away to ensure you have a safe home for you and your family. As your kids grow older, it is important that they understand how to properly operate your fireplace. While you won’t be handing them the matches and leaving the house anytime soon, teaching them how to safely use a fireplace is still wise. When they understand and respect the importance of fire safety, they will be less likely to meddle with your fireplace out of curiosity. Start by involving them when you build a fire. Teach them about the items that should and shouldn’t be used in a fireplace. Have them help you with putting out the fire as well. Instruct them on the basics of fireplace safety, such as never leaving a fire going while you are away and never using gasoline or other fire starters inside the home. You can also get them to help you out with fireplace chores, such as cleaning out the fireplace and keeping the area around the fireplace tidy and free of flammable debris. Make sure they feel comfortable asking any questions they might have. 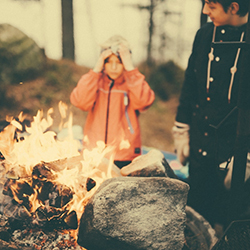 It is better for your kids to respect fire but not be afraid of it than to leave them uncertain about how to stay safe. Education is key to overcoming fear and preventing mistakes. While it is important to teach your kids how to properly operate a fireplace from a young age, you should also ensure they understand that no fire should ever be built without the supervision of an adult. If they love helping you out with building fires, make sure you allow for plenty of supervised opportunities for them to do so. By frequently letting them help you out, you can help prevent them from feeling the need to build a fire while you are away. Talk about how any fire can be dangerous as well. Make sure you set rules in your home about burning candles and using stove top burners. Kids are well-known for paying more attention to what we do than to what we say. If you teach your children about the importance of fire safety but you don’t follow your own advice, don’t be shocked when they mimic your actions instead of your words. For example, gasoline and lighter fluid should never be used inside your home to start a fire. If you explain this rule but then turn around and use lighter fluid to start a fire yourself, you will wind up setting a bad example. Remember, your kids watch every single thing you do. 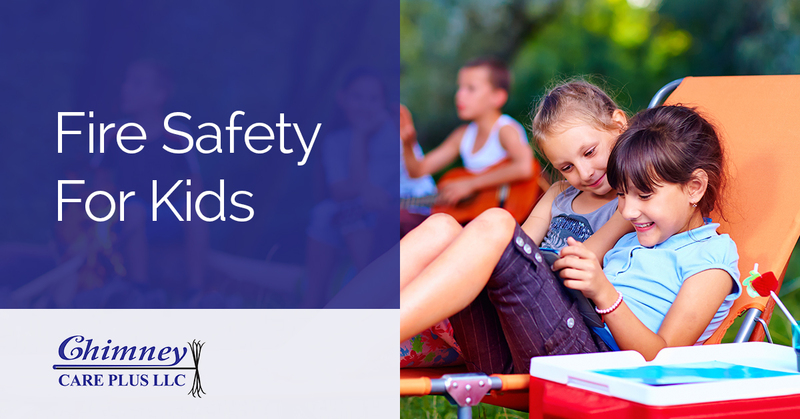 Show them the right way to keep the home safe by always practicing fire safety yourself. While ideally, you will never have to face a fire in your home, accidents can happen. Make sure you have a family fire plan that everyone understands. Teach your kids from a young age how to best exit a home in the case of a fire, how to dial 911 when safely away from the home, and where they should go to meet you. For small children, repetition of this plan will be key in helping them understand what to do in an emergency situation. One of the best ways you can keep your kids safe when you own a fireplace or a wood burning stove is to always properly maintain your chimney. Chimneys are not inherently dangerous but when they are left in disrepair or are never cleaned, they can be a major fire hazard. Take care of chimney cleaning and repairs in a timely fashion. For example, if you allow creosote to buildup in the walls of your chimney, you can cause a chimney fire. Or if a storm has passed through the area and has damaged your chimney, if you don’t handle repairs right away, the structural integrity of your chimney can be compromised leading to another fire hazard. If you are in need of chimney repair in Frederick or surrounding areas, please give our team a call today. We can assist you in keeping your family safe by providing you with the chimney services you need. Our expert chimney sweeps look forward to serving you soon.